The other wonderful thing about meals in bowls is that most of them also happen to make great leftovers. I take an inordinate amount of pride in work lunches, both Marcus and I will always have a muffin (shock! ), a chia pudding for me, yoghurt, a grapefruit or banana, hummus and a veg, and either leftovers – if Marcus didn’t eat everything – or a salad. I’ve really gotten into the whole mason-jar-salad thing, minus the mason jar. Tupperware works fine for me. Layering a dressing with veggies, fruits, nuts, chickpeas, greens, and protein is SO good for lunch. Canned tuna has never shone more!! This quinoa bowl is essentially the ultimate salad work lunch. It is delicious cold. Layer up the veg at the bottom, then the chicken, then the quinoa, and finally your greens on top. Your coworkers will be jealous! It will keep in the fridge several days after your assembly. 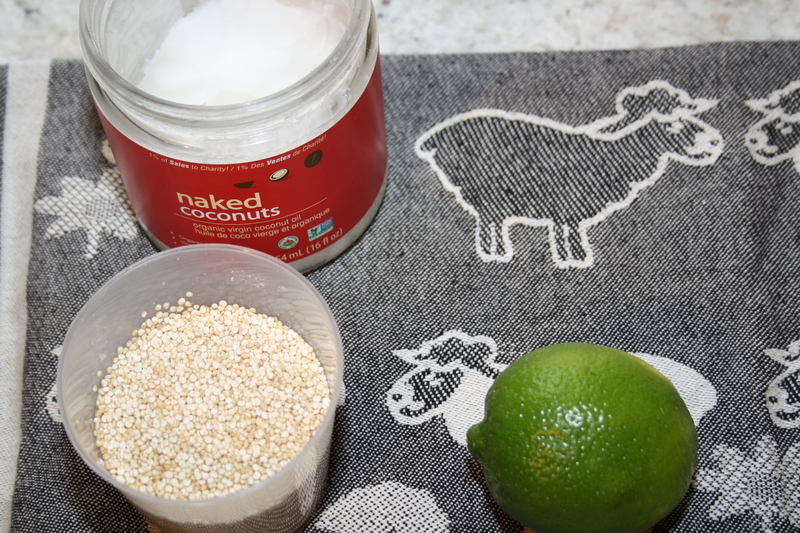 Before seeing and trying this recipe, it had never occurred to me to put coconut oil in my just-cooked quinoa. The quinoa soaks up the oil in quick fashion, and what’s left is a light, coconut flavour. And the smell is amazing. 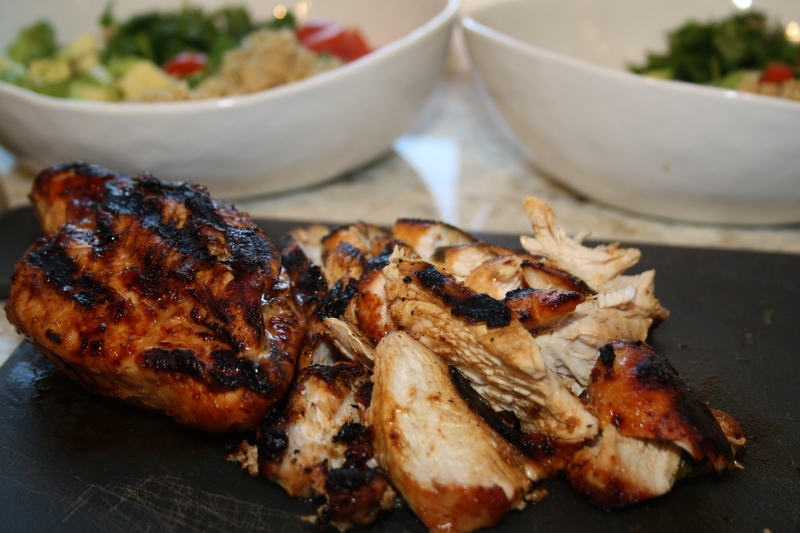 The coconut with the smokiness of the chicken and the punch of lime in the quinoa just works. If you don’t like coconut, omit it altogether or substitute with butter. 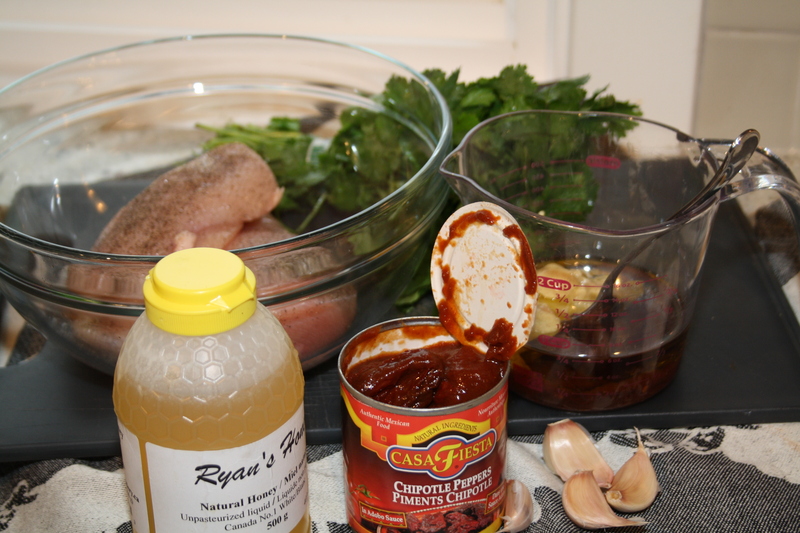 This meal comes together really quickly, especially if you start marinating the chicken the night before. It’s something I feel good making and good serving, and Marcus and I both look forward to quinoa-bowl night. Marcus’ bike training is ramping up, and he’s either hiding away spinning in the basement, or out enjoying the unseasonably good March Canadian weather. 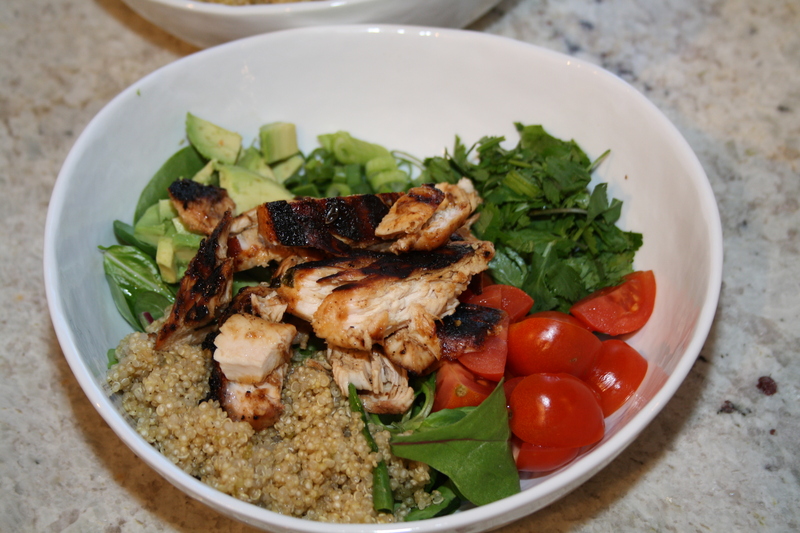 A quinoa bowl was perfect for a quick and easy dinner together, and perfect to fuel him up for some cycling. Race season is alllllmost here!! Place the chicken breasts in a medium bowl and sprinkle with salt and pepper. 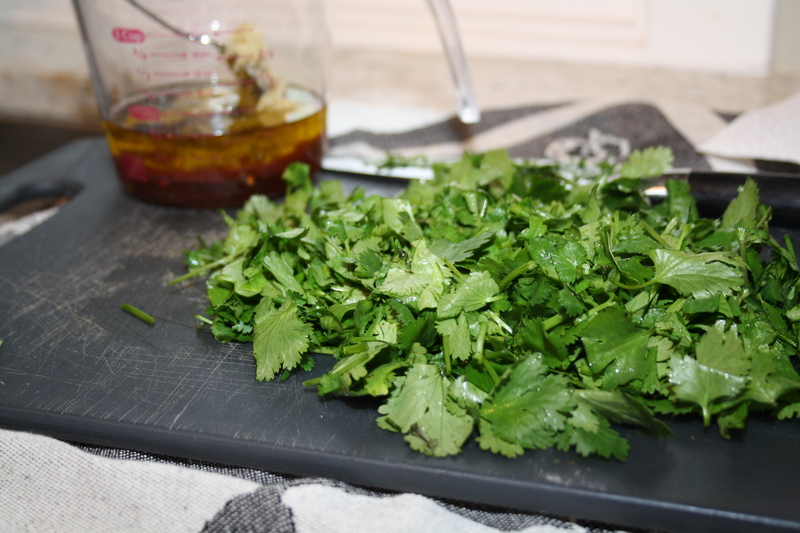 In a small bowl, whisk together the olive oil, chipotle sauce, honey, mustard, cilantro, and garlic. Pour over the chicken and stir it around to ensure the chicken is covered. Let marinate in the fridge for at least 2 hours, or ideally overnight. When you’re ready to cook, heat a grill on medium-high heat. Grill the chicken until cooked through, about 8 minutes per side. Once cooked, cut the chicken into slices. Alternatively, you can use a skillet on the stove, and cover the pan while the chicken is cooking. While the chicken is grilling, you can start on your quinoa. Stir together the quinoa and stock in a medium saucepan, and put over high heat. Once it comes to a boil, reduce heat to low and cover the pot. Cook for about 15 minutes, until all of the liquid is absorbed. Immediately stir in the coconut oil, lime juice, lime zest, salt, and pepper. 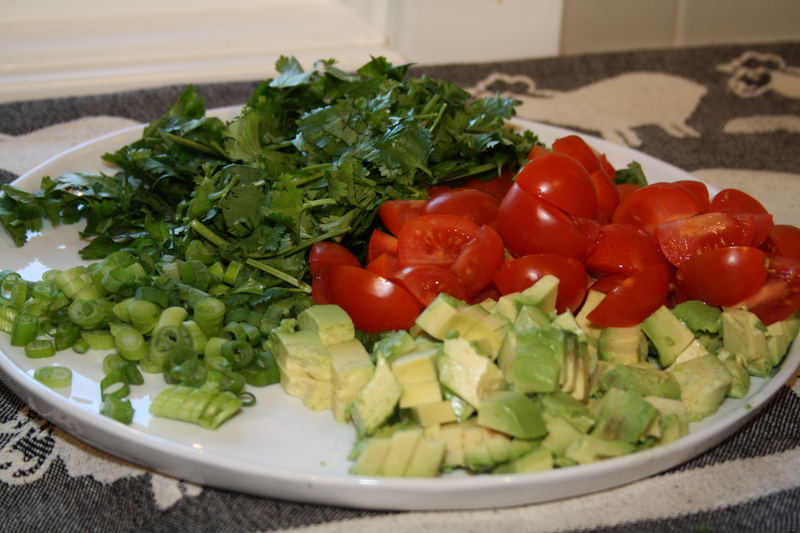 To assemble, first add the greens into a bowl. 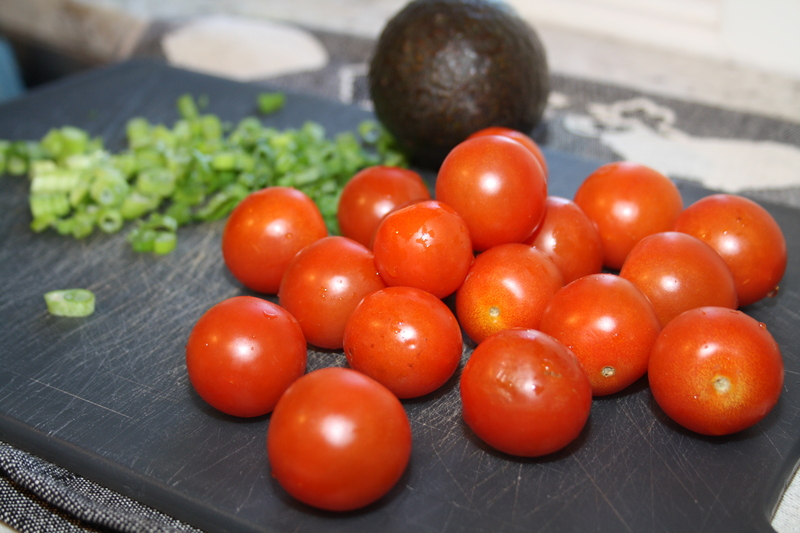 Add a scoop of the quinoa, some chicken, tomatoes, cilantro, green onions, and avocado. If desired, garnish with the extra lime juice, honey, and/or olive oil.